Tutankhamun was born a prince in Egypt's royal court around the year 1341 BC. His father was the Pharaoh Akhenaten. Tutankhamun's birth name was Tutankhaten, which he changed after his father died. Tutankhamun was born to one of his father's lesser wives and not to his main wife, the powerful Nefertiti. His presence may have caused some strain in the royal courts as Nefertiti had only daughters, but desperately wanted to have a son of her own to take over the throne. Tutankhamun's father was a religious radical. He changed the entire religion of Ancient Egypt to worship only the sun god Aten. He did away with over a thousand years of traditional Egyptian religion and forced people to change the way they worshiped. He even built a new capital city in honor of the god Aten called Amarna. At the young age of seven years old Tutankhamun's father died. A few years later Tutankhamun married his sister (which was common for Pharaoh's in Ancient Egypt) and became Pharaoh. Since he was so young he had help ruling the country. The real rulers were a powerful general named Horemheb and Tutankhamun's vizier named Ay. Many people of Egypt had been unhappy with the religious reforms of his father. Tutankhamun and his advisors tried to fix all the changes that his father had made. Under Tutankhamun Egypt returned to their old gods and the old temples were repaired. The capital city was also moved back to the city of Memphis. He even changed his name from Tutankhaten, "the living image of Aten", to Tutankhamun, "the living image of Amun". Tutankhamun died around the age of nineteen. Archeologists aren't sure what killed him. Some people think that he was assassinated, but the likely cause of his death was a wound to his leg. Scientists have determined that the leg of his mummy was broken and badly infected before his death. This injury probably happened from an accident. Tutankhamun is most famous today for his tomb in the Valley of the Kings. It is likely that his tomb was built for someone else and was used to bury the young Pharaoh when he died unexpectedly. This may have helped to keep his tomb hidden from thieves for all these thousands of years. As a result, when the tomb was finally discovered by archeologist Howard Carter in 1922, it was filled with treasure and artifacts unlike found in any other Pharaoh's tomb. 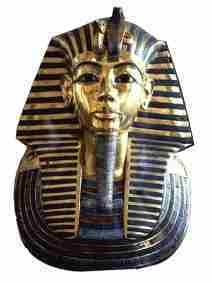 Other spellings of his name include Tutankhamen and Tutankhamon. He is sometimes called King Tut today. He had no surviving children. The successor to his throne was the vizier Ay. It is likely that another Pharaoh or two ruled for a short time between Tutankhamun and his father Akhenaten. These Pharaoh's were Smenkhkare and Neferneferuaten. Comedian Steve Martin sung a funny song about Tutankhamun called "King Tut". There was a villain on the Batman TV series called King Tut.